Goodacre, Charles J. / Blatz, Markus B. 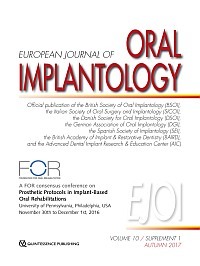 Foundation for Oral Rehabilitation (FOR) Consensus Text on "Prosthetic Protocols in Implant-Based Oral Rehabilitations"
Aim: To compare implant fixed complete dentures with implant overdentures relative to prosthodontic outcomes. Material and methods: An electronic Medline (PubMed) with MeSH terms, and Cochrane library search was performed, focusing on studies that included implant fixed complete dentures and implant overdentures in the same study, with the results based on studies that included both types of prostheses. Results: The following six categories of comparative studies were identified in the literature: 1) Implant and prosthesis survival; 2) Prosthesis maintenance/complications; 3) Bone changes; 4) Patient satisfaction and quality of life; 5) Cost-effectiveness; and 6) Masticatory performance. It was determined that both the fixed and removable treatments were associated with high implant survival rates. However, both types of prostheses were impacted by the need for post-placement mechanical maintenance or prosthetic complications. More maintenance/complications occurred with implant overdentures than with fixed complete dentures. Residual ridge resorption was greater with implant overdentures. Patient satisfaction was high with each prosthesis, with three studies revealing higher satisfaction with fixed complete dentures and five studies finding no difference. All but one study on cost-effectiveness indicated implant overdentures were more cost-effective. Based on two studies, it appears the masticatory performance of implant fixed complete dentures and implant overdentures is comparable. Conclusions: Multiple factors must be considered when determining whether an implant-fixed complete denture or implant overdentures are best suited for patients with completely edentulous jaws. Conflict-of-interest statement: The authors declare they have no conflicts of interest. Aim: The primary aim of this systematic review was to study the clinical outcomes of one-piece fixed complete dentures (complete arch fixed implant-supported prostheses) made of zirconia for edentulous patients. The secondary aim was to compare the clinical outcomes of monolithic zirconia vs zirconia veneered with porcelain (conventional, minimal or gingival) for fixed complete dentures. Materials and methods: Two investigators conducted an independent electronic search of the literature, using PubMed and Scopus search engines from January 1, 2000, to August 31, 2016. After application of pre-determined inclusion and exclusion criteria, the final list of articles was reviewed to meet the aims of this review. Results: A total of 12 observational studies were identified that satisfied the inclusion criteria of this systematic review. Short-term results from a combined 223 patients with 285 one-piece zirconia fixed complete dentures showed a mean failure rate of 1.4% due to the fracture of four prostheses. Prosthetic complications occurred in 46 prostheses (16.1%). Out of these, 42 prostheses (14.7%) had minor complications exclusive to fracture of veneered porcelain. Conclusions: Current evidence indicates that zirconia fixed complete dentures have a very low failure rate in the short term, but have a substantial rate of minor complications related to chipping of veneered porcelain. Use of monolithic zirconia with only gingival stains, or zirconia that is veneered only at the gingiva may offer promising results, but will need to be validated by future long-term studies. Conflict-of-interest statement: All authors report no conflict of interest. Aim: The impact of prosthetic material selection on implant survival is not clear. The current criteria for choosing a prosthetic material seem to be based on clinician preferences. This systematic review aims to evaluate the impact of restorative materials on the mid- and long-term survival of implants supporting single crowns and fixed partial dentures. Materials and methods: Hand and MEDLINE searches were performed to identify relevant literature for single crowns (SC) and fixed partial dentures (FPD). Further inclusion criteria were a mean follow-up period of at least 3 years, the inclusion of at least 10 patients in a relevant study cohort, and a clear description of prosthesis type and prosthetic material. Results: A total of 63 studies for the SC group and 11 studies for the FPD group were included. Full arch restorations were not included. The materials utilised in the SC group were metal-ceramic (precious and non-precious), lithium-disilicate, veneered zirconia, veneered alumina, and nanoceramics. The materials used in the FPD group were metal-ceramic (precious), veneered titanium, metal-resin (precious), and veneered zirconia. No significant impact on the prosthetic material relating to mid- or long-term implant survival was identified. Furthermore, there were no statistically significant differences between the survival rates of the dental prostheses made from different materials (SC and FPD group). Single crowns made of nanoceramics showed a higher risk for decementation relative to other materials (0.80, 95% CI [0.67; 0.89]; P < 0.0001), whereas metal-resin FPDs showed a higher risk for chipping (0.36, 95% CI [0.23; 0.52]; P = 0.0072). Conclusion: The current evidence suggests that prosthetic material selection has no influence on mid- and long-term survival of implants restored with single crowns and fixed partial dentures. Similarly, the prosthetic material seems to have no significant impact on prosthetic survival rates. Further research is required to provide more evidence regarding the impact of the prosthetic material on long-term outcome. Aim: The aim of this systematic review was to evaluate and synthesise the existing evidence on the effect of the prosthetic implant abutment design and fabrication process on mechanical, biological and aesthetic clinical outcomes. Materials and methods: Two electronic databases (PubMed and Embase) were searched in August 2016 to identify clinical studies evaluating the clinical outcomes of CAD/CAM abutments. The studies were screened and two reviewers used the full text to extract data independently. A qualitative synthesis was performed on the extracted data and summary tables were prepared. Due to heterogeneity in the studies included, no meta-analysis was performed. Results: Twenty-four studies were included in this review. Of these, 13 studies focused solely on CAD/CAM abutment and did not include a control group, or a comparison with conventional implant abutments. Eleven studies compared clinical outcomes of CAD/CAM abutments with conventional abutments. There were only three clinical trials and the majority of the studies were observational or case series studies. The most commonly reported clinical outcomes measured were soft tissue volume and aesthetic scores, survival and success rates, and marginal bone levels. Conclusion: The results of the review demonstrate that CAD/CAM abutments had overall good survival and success rates and that they provide comparable, if not better, clinical outcomes when compared with conventional abutments. However, existing evidence is weak as few randomised control trials were conducted and follow-up periods were, in general, short. Conflict-of-interest and funding statement: The authors report no financial or other relationships that might lead to a conflict of interest. This systematic review was conducted as a part of the 2016 Foundation of Oral Rehabilitation Consensus Conference on "Prosthetic Protocols in Implant-based Oral Rehabilitation". The authors received no funding to conduct the systematic review, but received reimbursement to participate in the Consensus Conference. Statement of problem: Zygomatic implants have been utilised for the treatment of the severely atrophic maxilla since 1998. However, few articles exist as to the success of zygomatic implants and immediate loading of its prosthesis. Aim: To systematically review the outcome of immediate loaded zygomatic implants. Materials and methods: An electronic PubMed search was performed to identify case reports, prospective and retrospective studies of immediately loaded zygomatic implants with a mean follow-up of 12 months. Assessment of the identified studies was performed using the Delphi method. Reviewers independently assessed the articles for inclusion, with a facilitator coordinating responses. A consensus was reached on the articles that were included. Results: The search provided 236 titles for immediately loaded zygomatic implants and resulted in 106 abstracts for analysis. Full-text analysis was performed on 67 articles, resulting in the inclusion of 38 articles for this systematic review. Conclusion: Based on the present systematic review, the authors report that immediately loading zygomatic implants for the restoration of the severely atrophic maxilla presents a viable alternative for treatment of the atrophic maxilla. Spitznagel, Frank A. / Horvath, Sebastian D. / Gierthmühlen, Petra C.
Aim: The purpose of this systematic review was to assess the clinical performance of implant-supported monolithic all-ceramic single- and multi-unit restorations. Materials and methods: The electronic databases of MEDLINE via PubMed, the Cochrane Library (CENTRAL) and EMBASE were searched for clinical studies on monolithic all-ceramic single and multi-unit implant-supported fixed dental prostheses. Human studies with a mean follow-up of at least 2 years and published in English or German language peer-reviewed journals up until August 2016 were included. Two independent examiners conducted the literature search and review process. Results: The search resulted in 2510 titles and of these, 57 studies were selected for full-text evaluation. Three studies were included on the basis of the pre-determined criteria. Two articles reported on monolithic lithium disilicate implant-supported single crowns (SC) and revealed a survival rate of 97,8 and 100% after 3 years. One study investigated implant- supported monolithic zirconia SCs and fixed partial dentures (FPD) and showed a survival rate of 100% after 5 years. No studies could be identified on the clinical performance of monolithic resin matrix ceramic restorations. Clinical studies are lacking on the long-term outcome of implant-supported monolithic all-ceramic single- and multi-unit restorations. Conclusions: Preliminary clinical data indicate high short-term survival for implant-supported monolithic lithium disilicate and zirconia single- and multi-unit restorations. Randomised clinical studies and observations with a longer duration are necessary to validate the broad application of this therapy. Aim: The use of intraoral scanners (IOS) for making digital implant impressions is increasing. However, there is a lack of evidence on the accuracy of IOS compared with conventional techniques. Therefore, the aim of this systematic review was to collect evidence on the accuracy of digital implant impression techniques, as well as to identify the main factors influencing the accuracy outcomes. Materials and methods: Two reviewers searched electronic databases in November, 2016. Controlled vocabulary, free-text terms, and defined inclusion and exclusion criteria were used. Publications in English language evaluating the accuracy outcomes of digital implant impressions were identified. Pooled data were analysed qualitatively and pertinent data extracted. Results: In total, 16 studies fulfilled the inclusion criteria: one in vivo and 15 in vitro studies. The clinical study concluded that angular and distance errors were too large to be acceptable clinically. Less accurate findings were reported by several in vitro studies as well. However, all in vitro studies investigating the accuracy of newer generation IOS indicated equal or even better results compared with the conventional techniques. Data related to the influence of distance and angulation between implants, depth of placement, type of scanner, scanning strategy, characteristics of scanbody and reference scanner, operator experience, etc were analysed and summarised. Linear deviations (means) of IOS used in in vitro studies ranged from 6 to 337 µm. Recent studies indicated small angle deviations (0.07-0.3°) with digital impressions. Some studies reported that digital implant impression accuracy was influenced by implant angulation, distance between the implants, implant placement depth and operator experience. Conclusions: According to the results of this systematic review and based on mainly in vitro studies, digital implant impressions offer a valid alternative to conventional impressions for single- and multi-unit implant-supported restorations. Further in vivo studies are needed to substantiate the use of currently available IOS, identify factors potentially affecting accuracy and define clinical indications for specific type of IOS. Data on Data on accuracy OF digital records, as well as accuracy of printed or milled models for implant-supported restorations, are of high relevance and are still lacking. Conflict-of-interest and funding statement: The authors state there is no conflict of interest. Background and aim: Compromised fit between the contact surfaces of screw-retained implant-supported fixed dentures (IFDs) is thought to create uncontrolled strains in the prosthetic components and peri-implant tissues, thus evoking biological and technical complications such as bone loss, screw loosening, component fractures and, at worst, loss of implants or prostheses. The aim of this systematic review was to evaluate the impact of marginal misfit on the clinical outcomes of IFDs, and to elucidate definition and assessment methods for passive fit. Materials and methods: A systematic review of the literature was conducted with a PICO question: "For partially or complete edentulous subjects with screw-retained IFDs, does the marginal misfit at the implant-prosthesis interfaces have an impact on the clinical outcomes?". A literature search was performed electronically in PubMed (MEDLINE) with the help of Boolean operators to combine key words, and by hand search in relevant journals. English written in vivo studies published before August 31, 2016 that reported on both clinical outcome and related implant prosthesis misfit (gap, strains, torque) were selected using predetermined inclusion criteria. Results: The initial search yielded 2626 records. After screening and a subsequent filtering process, five human and five animal studies were included in the descriptive analysis. The selected studies used different methods to assess misfit (linear distortion, vertical gap, strains, screw torque). While two human studies evaluated the biological response and technical complications prospectively over 6 and 12 months, the animal studies had an observation period < 12 weeks. Four human studies analysed retrospectively the 3 to 32 years' outcomes. Screw-related complications were observed, but biological sequelae could not be confirmed. Although the animal studies had different designs, bone adaptation and implant displacement was found in histological analyses. Due to the small number of studies and the heterogenic designs and misfit assessment methods, no meta-analysis of the data could be performed. Conclusions: The current literature provides insufficient evidence as to the effect of misfit at the prosthesis-implant interface on clinical outcomes of screw-retained implant-supported fixed dentures. Marginal gaps and static strains due to screw tightening were not found to have negative effects on initial osseointegration or peri-implant bone stability over time. Based on two clinical studies, the risk for technical screw-related complications was slightly higher. While the degree of tolerable misfit remains a matter of debate, the present data do not imply that clinicians neglect good fit, but aim to achieve the least misfit possible. Conflict of interest statement: The authors declare no conflict of interest. The review was conducted as part of the 2016 Foundation of Oral Rehabilitation Consensus Conference on "Prosthetic Protocols in Implant-based Oral Rehabilitation". Conejo, Julian / Kobayashi, Toyoaki / Anadioti, Evantia / Blatz, Markus B. Aims: This review assessed the available evidence on the performance of CAD/CAM monolithic implant-supported restorations bonded to titanium (Ti) inserts and bases, which has become a popular concept. Materials and Methods: An electronic and manual search of PubMed databases was conducted to identify studies published in English between 2000 and 2016 on the performance of monolithic ceramic implant restorations with Ti inserts. Results: The initial search revealed 505 titles. Full-text screening was carried out for 70 studies, yielding 25 articles that met the inclusion criteria. No clinical studies could be identified regarding the performance of monolithic ceramic restorations bonded to Ti inserts. Laboratory studies on selected aspects and studies on similar prosthetic designs indicate that Ti inserts improve the overall fracture strength of ceramic abutments and crowns, protect the implant connection from wear, and offer a better marginal fit when compared with all-ceramic abutments. Conclusions: While laboratory studies and evaluations of similar designs indicated promising outcomes, clinical studies that evaluate the performance of CAD/CAM monolithic implant-supported restorations bonded to Ti inserts and bases are needed.